Summertime has a dichotomous nature. As we all attempt to slow down and enjoy these precious and fleeting months of warmth and sunshine, time also seems to speed by as the days fill up with activities. Having quick, easy, and nutrient-rich snacks on hand is essential in order to stay fueled up and ready for that next adventure. Bliss balls are a perfect option. They don't take long to make, can be customized to use ingredients you already have on hand, and don't necessarily need to be kept in the fridge making them a great option for camping and/or hiking. They're also energy-rich and can be made with lots of hidden superfoods to make sure your body is getting a plethora of vitamins and minerals while you're out having fun. 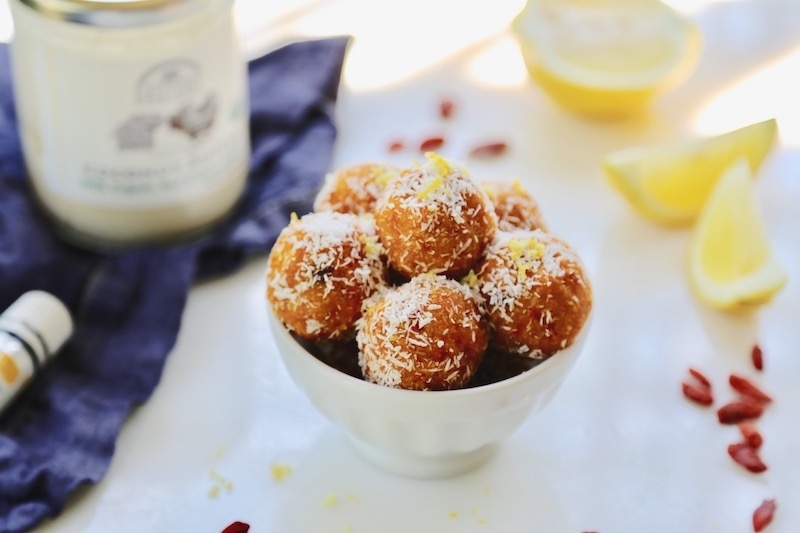 These particular bliss balls are bursting with vibrant lemon and coconut flavor. The goji berries add a little extra sweetness and chewiness, not to mention they're one of the most nutrient-dense superfoods out there. Goji berries, otherwise known as wolfberries, are native to China and are known for being one of the most antioxidant-rich foods on the planet. They're also a great source of beta-carotene and Vitamin C, critical nutrients for keeping the skin healthy and radiant. Beyond that, they also contain all 9 essential amino acids making them a complete protein. Known in Chinese medicine as a longevity food, they're also a great source of unique polysaccharide carbohydrates known as Lycium barbarum polysaccharides (LBP's) which have been associated with a number of health benefits ranging from helping protect the brain against Alzheimer's disease to helping guard against strokes. This recipe is gluten-free, soy-free, raw, vegan, and paleo-friendly. It's also free of all refined sweeteners and contains plenty of healthy fats and fiber to help keep blood sugar stable. Enjoy! 1. Using a food processor (or blender will also work in a pinch) mix all ingredients except goji berries and lemon oil (or zest) in a food processor until well combined. If using a blender put coconut and almond flour in first as this will help the blades catch and mix everything thoroughly. Stop and scrape the sides of your blender/food processor carafe and mix again as needed. 2. Mix in goji berries and lemon oil/zest and blend again. 3. 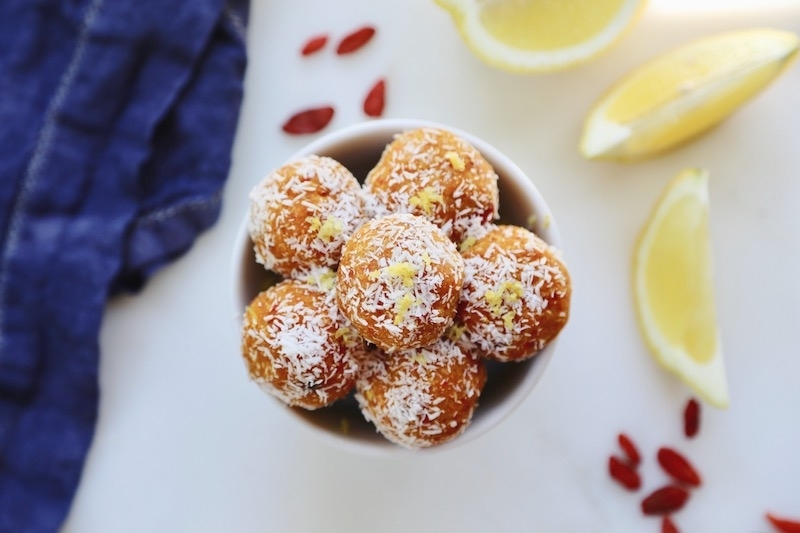 Remove mixture from food processor (or blender) and roll into balls over a plate covered in coconut flakes. Garnish with extra lemon zest. Store in fridge, although these will not go bad easily if left at room temperature.